The Mandarin/the Standard Chinese also known as Modern Standard Mandarin, also often referred to as Putonghua or simply "Mandarin", is a standard language that is the sole official language of both China and Taiwan, and also one of the four official languages of Singapore. The pronunciation of the standard is based on the Beijing dialect, its vocabulary is drawn from Mandarin dialects, and the grammar is based on literature in the modern written vernacular. The phoneme inventory of Standard Chinese consists of about two dozen consonants, of which only /n/, /ŋ/, and under certain circumstances the retroflex approximant /ɻ / can occur in the syllable coda, about half a dozen vowels, some of which form diphthongs, and four tones, one of which is marked with creaky voice. In December 2004, the first survey of language use in the People's Republic of China revealed that only 53% of its population, about 700 million people, could communicate in Standard Chinese. According to Nationalencyklopedin's census of 2007 and 2010 respectively 935, 955 millions and Fraction of world population in 2007 is 14.1% speaks Mandarin. The Spanish (Español), also called Castilian is a Romance language that originated in the Castile region of Spain and today has 518 million speakers across the world, 427 million as a native language. Spanish is a part of the Ibero-Romance group of languages, which evolved from several dialects of common Latin in Iberia after the collapse of the Western Roman Empire in the 5th century. Beginning in the early 16th century, Spanish was taken to the colonies of the Spanish Empire, most notably to the Americas, as well as territories in Africa, Oceania and the Philippines. From its beginnings, Spanish vocabulary was influenced by its contact with Basque and Germanic languages, as well as by neighboring Ibero-Romance languages, and later it absorbed many Arabic words during the Al-Andalus era in the Iberian Peninsula. Spanish is one of the six official languages of the United Nations. It is also used as an official language by the European Union, the Organization of American States, and the Union of South American Nations, and by many other international organizations. The English is a West Germanic language that was first spoken in early medieval England and is now a global language (lingua franca). English is either the official language or an official language in almost 60 sovereign states. It is the most commonly spoken language in the United Kingdom, the United States, Canada, Australia, Ireland, and New Zealand, and it is widely spoken in some areas of the Caribbean, Africa, and South Asia. It is the third most common native language in the world, after Mandarin and Spanish. It is the most widely learned second language and is an official language of the United Nations, of the European Union, and of many other world and regional international organizations. Through all types of printed and electronic media, as well as the emergence of the United States as a global superpower, English has become the leading language of international discourse and the lingua franca in many regions and in professional contexts such as science, navigation, and law. According to Nationalencyklopedin's census of 2007 and 2010 respectively 365, 360 millions and Fraction of world population in 2007 is 5.52% speaks English. The Hindi (हिन्दी) also called Modern Standard Hindi is a standardized and Sanskrit register of the Hindustani language. Hindi is an official language of the Union of India, and the lingua franca of the Hindi belt languages. In the 2001 Indian census, 258 million people in India reported Hindi to be their native language. However, this number includes tens of millions of people who are native speakers of related languages but who consider their speech to be a dialect of Hindi. Hindi is the fourth-most natively spoken language in the world, after Mandarin, Spanish and English. According to Nationalencyklopedin's census of 2007 and 2010 respectively 295, 310 millions and Fraction of world population in 2007 is 4.46% speaks Hindi. The Arabic (العَرَبِية‎, al-ʻarabiyyah) is the Classical Arabic language of the 6th century and its modern descendants excluding Maltese. Arabic is spoken in a wide arc stretching across Western Asia, North Africa, and the Horn of Africa. Arabic belongs to the Semitic branch of the Afroasiatic family. Arabic is a Central Semitic language, closely related to Aramaic, Hebrew, Ugaritic and Phoenician. Standard Arabic is distinct from and more conservative than all of the spoken varieties, and the two exist in a state known as diglossia, used side-by-side for different societal functions. If Arabic is considered a single language, it is perhaps spoken by as many as 422 million speakers (native and non-native) in the Arab world, making it one of the six most-spoken languages in the world. If considered separate languages, the most-spoken variety would most likely be Egyptian Arabic with 89 million native speakers still greater than any other Afroasiatic language. Arabic also is a liturgical language of 1.6 billion Muslims. It is one of six official languages of the United Nations. Portuguese (português) is a Romance language and the sole official language of Angola, Brazil, Cape Verde, Guinea-Bissau, Mozambique, Portugal, and São Tomé and Príncipe. It also has co-official language status in East Timor, Equatorial Guinea, and Macau. As the result of expansion during colonial times, a cultural presence of Portuguese and Portuguese creole speakers are also found in Goa, Daman and Diu in India; in Batticaloa on the east coast of Sri Lanka; in the Indonesian island of Flores; and in Malacca in Malaysia. According to Nationalencyklopedin's census of 2007 and 2010 respectively 205, 215 millions and Fraction of world population in 2007 is 3.08% speaks Portuguese. The Bengali (বাংলা/Bangla) is the language native to Bangladesh and the Indian state of West Bengal. It is written using the Bengali alphabet. Standard Bangla in Bangladesh and Bengali West Bengal are marked by many differences in words, usage, accent, and phonetics. Bangla is the national language in Bangladesh and second most spoken language in India. With about 250 million native and about 300 million total speakers worldwide, it is the seventh most spoken language in the world by total number of native speakers and the eleventh most spoken language by total number of speakers.The importance of this language to the countries of South Asia is illustrated by the history of the national anthems of Bangladesh and India and the national song of India, all first composed in the Bengali language. The Russian (ру́сский язы́к, russkiy yazyk) is an East Slavic language and an official language in Russia, Belarus, Kazakhstan, Kyrgyzstan and many minor or unrecognized territories. It is an unofficial but widely-spoken language in Ukraine, Latvia, Estonia, and to a lesser extent, the other countries that were once constituent republics of the Soviet Union and former participants of the Eastern Bloc. Russian belongs to the family of IndoEuropean languages and is one of the three living members of the East Slavic languages. Written examples of Old East Slavonic are attested from the 10th century and beyond. It is the most geographically-widespread language of Eurasia and the most widely spoken of the Slavic languages. It is also the largest native language in Europe, with 144 million native speakers in Russia, Ukraine and Belarus. Russian is the eighth most spoken language in the world by number of native speakers and the seventh by total number of speakers. 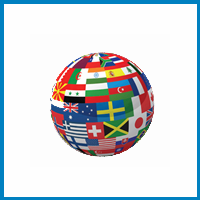 The language is one of the six official languages of the United Nations. The Japanese (日本語 Nihongo) is an East Asian language spoken by about 125 million speakers, primarily in Japan, where it is the national language. It is a member of the Japonic (or Japanese-Ryukyuan) language family, whose relation to other language groups, particularly to Korean and the suggested Altaic language family, is debated. Japanese has no genetic relationship with Chinese, but it makes extensive use of Chinese characters, or kanji (漢字? ), in its writing system, and a large portion of its vocabulary is borrowed from Chinese. According to Nationalencyklopedin's Fraction of world population in 2007 is 1.92% speaks Japanese. The Punjabi Language (Shahmukhi: پنجابی paṉjābī; Gurmukhi: ਪੰਜਾਬੀ pañjābī) is an Indo-Aryan language spoken by 102 million native speakers worldwide, making it the 10th most widely spoken language in the world. It is the native language of the Punjabi people who inhabit the historical Punjab region of Pakistan and India. It is the only living language among the Indo-European languages which is a fully tonal language. Punjabi is the most widely spoken language in Pakistan, the eleventh-most widely spoken in India, and the third-most spoken native language in the Indian Subcontinent. Punjabi is the fourth-most spoken language in the United Kingdom and third-most spoken native language in Canada. According to Nationalencyklopedin's census of 2007 and 2010 respectively 95, 100 millions and Fraction of world population in 2007 is 1.44% speaks English.